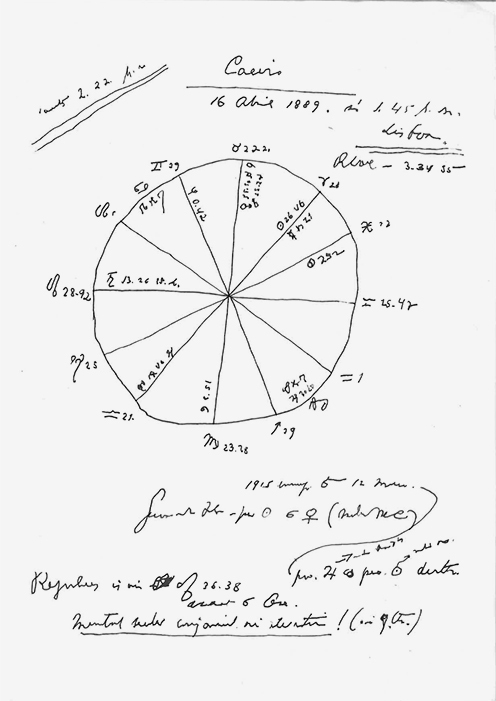 I want to find a way to bring Alberto Caeiro to life through the geometric shape in the Astrological Chart that Fernando Pessoa drew for him around 1914. I want to find a scientific process to translate this diagram into the feasible conditions of production of a real human being. Through a friend who is involved in the academic scientific world in Portugal I found my way to discuss this subject with a scientist from the university of Porto who spends much of his time researching in the neurology department of that University and who also collaborates with research institutes such as the MIT, Rockefeller University, University of Cambridge, Max Planck Society among others. He preferred to keep his anonymity due to the fact that we had a very brief conversation based on non-verified hypothesis and because ethically speaking this is a very delicate subject to which he doesn’t want to be related in the future. D: My idea is to use the diagram configured by an astrological chart to create a human being. I want you to tell me if it’s possible and how to do it.
? : Let me see. First of all, why on earth would you do something like that? Second, from the stand of our deontological ethics is totally unacceptable! If one day someone puts something like that in motion I would be part of the first ones to actively oppose it. Meaning that I would go and set the place where someone might be pursuing such a thing on fire. But if you put it as a joke… I love good jokes. So, where can I start…? D: From the beginning. The geometric shape… I want to bring Alberto Caeiro “back” to life! Ok. We have a geometric shape, a figure that is the result of a pseudo-scientific calculation, an astrological calculation. But it’s a shape with precise edges that we can measure, analyze, reproduce, turn into a mathematical formula that can be turned into a code, and then an algorithm that can be interpreted by machines that can materialize a human replica using 3D Bio printing technology. This already exists and according to some companies will be very common in 10 or 20 years. They are preparing the market. If this is accurate in 10 or 20 years we can print human organs, and body parts using artificial human tissues made from human stem cells that can have a real function in a human body. We can already produce artificial human skin. You now that don’t you?
? : It’s already being used. The material part of your problem is not such a big deal because of the possibilities that already exist and the ones we see becoming real in a near future in terms of materializing human body parts. Eventually we can produce something that looks exactly like a human being as we please. Short, tall, blond, dark, blue eyes, brown eyes, black, white, red or yellow, whatever. If there is a specific body part that is still not possible to produce it will be for sure in the future. Just give time for genetic research and technology to develop and then to companies to see a business opportunity and it will be common. Every hospital will have its own 3D Bio printing team producing organs and body parts. Prosthetics as we know it today will become totally obsolete. Even the production of the human brain had major breakthroughs recently when a team from an Austrian lab managed to produce a mini human brain! These brains are not as our normal brain. They are a sort of primitive version of it, developed from human stem cells, that give us the perspective that it will be possible to breed brains like ours in petri dishes in the future. Recently Jeremy England, a physicist assistant professor at the MIT, came up with a new theory about the existence of life that might be interesting in connection to the brain breeding I just mentioned. D: Can you tell me about it?
? : … well, it’s something that is dividing scientists. Many people have great expectations on how it will develop and others dismiss it as sheer speculation. Realistically speaking I have doubts, but for your fictional project here it might be interesting. From the standpoint of physics, there is one essential difference between living things and inanimate clumps of atoms. The first one tends to be much better at capturing energy from their environment and dissipating it as heat. This is what makes a living being a living being, it is a closed self regulated system that processes energy into heat in a way that makes it’s cells self replicate and configure a complex organism. An organism such as a plant or an animal. Maybe we can say that this process of turning energy into heat is a sort of metabolism that regulates the growth of a living organism. What England claims is that if we provide the proper environment to a group of atoms, a proper source of energy within a proper heat bath (in other words a proper atmosphere), it can gradually restructure itself in order to dissipate increasingly more energy, in other words it can optimize its condition to grow, organize itself and become a proper living organism as I just said. In England’s words “You can start with a random clump of atoms, and if you shine light on it for long enough, it should not be so surprising that you get a plant.”. The Austrian team developed human brain tissue from human stem cells and placed it into a spinning bioreactor that circulates oxygen and nutrients, catalyzing the eventual growth of cerebral organoids. I mean cerebral organisms, cells linked together in order to form a complex organism that in this case is a brain. And after one month, the tissue had organized itself into basic developing brain regions, including the retina and cerebral cortex. What basically I’m saying is that these guys did with a human brain what England is speculating about life in the planet in general. They putted specific cells together, consider them as the atoms that England refers to, in a specific set of conditions to produce a specific organism. I didn’t verify this myself but the sources are credible and therefore we can assume that it will be possible to make a human brain exactly like ours at some point in the future. We have more than enough knowledge to pursue that. It’s yet not possible but we know the way to get there. I’m putting all these things in a simple way so that you can understand because you don’t have the scientific knowledge to understand the technical terms but obviously there is a lot implicated in this. D: Can you be more specific? I’m very interested! Ok, then I just give you some topics for you to look more in depth. Jeremy England is dealing with the second law of thermodynamics, also known as the law of increasing entropy or the arrow of time. Thermodynamic equilibrium. Closed systems and open systems. A body is a closed system in an irreversible thermodynamic equilibrium. Self-replication as a ‘survival’ strategy of the matter, in other words, the cells in a body replicate themselves to survive, to constitute a whole that gives them higher chances of survival or, even in other words, your body grows to sustain itself in terms of energy processing and to process more. One of the steps forward that England gives is that he considers systems as small as chemical circuits involving a few biomolecules that then replicate themselves in a scale of let’s say… a human body. Do you understand? He puts a complex organism as a large version of a very simple small system and he validates that assumption with a mathematical formula. I’m sure it’s an insane complex formula and I’m not going into that because I have little knowledge of it and I’m not a physicist and we’re just fooling around with these ideas. In this sense we can even consider that we have two possibilities to produce a human being.
? : Yes and a big one! D: Another But…? Please go on!
? : … I’m just making a mash of things that might become an interesting idea for your work. … my colleague Max Tegmark, also from the MIT, is working on the idea that consciousness is a state of matter. I say idea because his approach is totally conceptual. He doesn’t mean that there is a physical part of your brain that is powering your sense of self and your awareness of the world. He’s saying that it arises from a particular set of mathematical conditions that has varying degrees of existence just as certain conditions are required to create varying states of vapor, water and ice. He calls this state of matter the “perceptronium” and uses the term substance when it comes to refer to it. It is a conceptual construction that serves us to understand how does the conscious is formed. Do you see? We are talking about the most general substance that feels subjectively self-aware in a conceptual level. This substance stores and processes information in a way that forms a unified indivisible whole. Because consciousness is impossible to divide, it either exists or not, and it is independent from the outside, its information dynamics is determined from within even when of course influenced by external conditions. Tegmark says that if so and if it is a state of matter than it constitutes itself as a means to an end (as a device that processes the surrounding world) but also as an end in itself (something that works to feed itself) and to constitute itself as an object. Maybe I’m starting to loose it a bit but let’s go on. D: I think I lost it a while ago but please go on! I bring over the work of my colleague Tegmark because if we end up saying that consciousness is an object then we have a ground to speculate on the possibility of using the geometrical figure of the astrological chart as an object that might serve as a model for creating the consciousness of your poet, Alberto Caeiro. This is also a bit like Ray Kurzweil and his speculation on how to create a mind. In very very simplistic terms he claims that you can create a mind by pattern recognizers. In a way it goes in the same direction as saying that the mind is a mathematical matter. It puts the solution on something that even if very complex and difficult to grasp, is purely logical. If it’s purely logical then we can reduce it to a formula that we can apply and vice-versa, it’s like a spiral in terms of how and why.
? : Maybe all those things about sacred numbers and geometry could add something to this. Maybe in terms of methodology could be interesting. D: Don’t mind my ignorance, please go on!
? : Pessoa is a reference not only for artists and poets, but also for scientists like me. Artists are very important for neuroscience and do you know why? Because, the brain loves the brain. The human brain tends to replicate itself when confronted to creative tasks performed in an external environment. For example, I saw your drawings and for me they are brain structures. You told me you never thought about it and that’s really great news because it proves that your creative process is in a way something similar to what I said about England’s systems. The brain spontaneously works to expand and grow its capacity of processing energy when exposed to favorable conditions. In a movement that goes outwards it engenders forms of interaction that replicate itself, in this case literally as an object. From this point of view, an art practice is an expanded human brain, therefore, something very interesting for neuroscience. It exposes the inner nervous logic of a human brain almost as if we can see it in motion and expanding in front of our eyes. D: That’s a very interesting perspective on an art practice…! What about Caeiro?
? : Yes, back to Pessoa, Caeiro and the Amplituhedron. I see Pessoa’s heteronymous as entities that somehow produce a fracture in our notions of time and space. They engendered a substance that is freed from time and space. Their existence somehow draws a parallel with the Amplituhedron. Do you get my point? If you apply the idea of particle interaction with no influence of time and space to Caeiro’s existence based on his life geometry (his astrological chart) under the light of the things I’ve told you during this conversation, maybe you can bring him back. Back from another world like the recursion relations that Arkani-Hamed talks about in his research on the Amplituhedron. He says that what we need to understand is what world is that. His study shows us that time and space perception is a matter of perspective. Other researchers are actually saying that the universe is a 2D environment that we perceive as 3D because we encode it like that. Like a codec that unfolds a compacted file. If we shift perspective we can understand many things we could never imagine. In the end of the day the understanding of what is that shift is what as been shaping science and knowledge since human existence. It’s a fact that in Physics there are different spacial dimensions, that particles can travel through them and that they can even exist in several of them at the same time. What does it mean to bring someone back? Do you really believe that Caeiro is just a well thought fiction? That he had never been in this world? At the same time that he had never been here, he had always been here. Pragmatically speaking he might already exist. The geometric object we have, made out of those astrological calculations, is just the object that allows us to decode it as we decode the illusory 3D out of the real 2D of the universe and tap into the logic of its existence as a form of reality that we perceive from a certain perspective and that we can eventually turn on and off. this work was made for the Museum of Immortality, an exhibition initiated by Anton Vidokle following a curatorial concept by Boris Groys.